Great to see the "Dog Party" finally get a win after 27 years and it's probably because Terry is getting older and couldn't be bothered to throw one of the others off the boat when they were being dead weight... hopefully this smell of victory will help him pick up his golf game as I'm getting a little tired of carrying him in our partners game.... seriously guys, GREAT VICTORY!!! This year's Chester Race Week marked a special milestone for Terry McKenna and his eight man sailing crew. For the first time in 27-years of competing in the annual regatta held in Chester, N.S., McKenna and his crew came in first. Which, according to McKenna, is no easy feat. "You have to be at the top of your game," McKenna said. He added without the help of his three brothers David, Paul and Mark as well as the rest of the crew Doug Wright, Jamie Hill, Don Garrett and Ron Switzer, he wouldn't have seen the same success. "Every one of my crew members played an integral part in us winning the regatta," he said. " It's never one person. It's everybody." And McKenna would know. He's been sailing since he was eight-years-old. "It's kind of in the family," he said, adding Chester Race Week isn't the only regatta he sails in. He also competes in the Charlottetown regatta and one in Lunenburg, N.S. 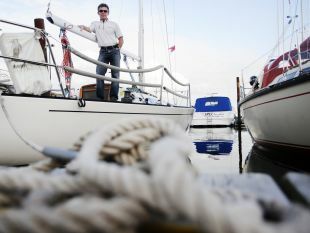 However, Chester Race Week is the largest he competes in with roughly 150 boats from across Atlantic Canada and parts of the eastern United States involved. "When we won the regatta we were really pleased," McKenna said. "We've been doing this a long time." But this year things just seemed to fall into place. "You have to have a good crew and the weather conditions were optimal for us," he said. "We were in a groove and we just kept going." The placing is based on how many points a team has after a week of racing. The more times a team places first, second or third the more points they have. McKenna and his team competed in 10 races and kept in the top three in all but two races.